You are given a tree with N vertices and an integer K. The vertices are numbered 1 through N. The edges are represented by pairs of integers (a_i, b_i). For a set S of vertices in the tree, let f(S) be the minimum number of the vertices in a subtree of the given tree that contains all vertices in S.
There are ways to choose K vertices from the trees. For each of them, let S be the set of the chosen vertices, and find the sum of f(S) over all ways. Since the answer may be extremely large, print it modulo 924844033(prime). Since it was too easy for him, he decided to solve this problem for all K = 1,2,...,N.
Print N lines. The i-th line should contain the answer to the problem where K=i, modulo 924844033. 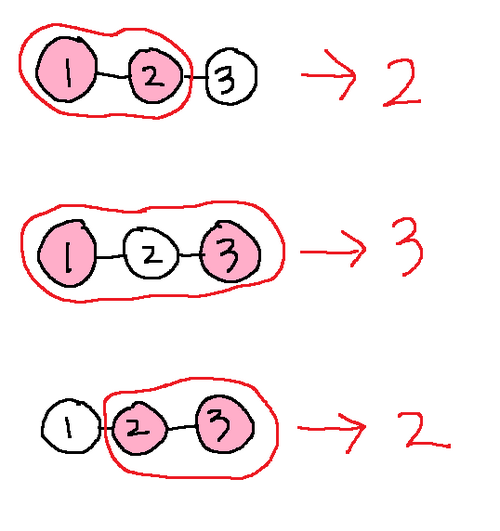 The diagram above illustrates the case where K=2. The chosen vertices are colored pink, and the subtrees with the minimum number of vertices are enclosed by red lines.